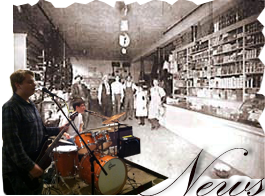 Hodgeden (left) and shopkeeper Gunner Julum (right) at the general store. Born in Maine in 1843, Samuel Hodgeden arrived in Minnesota as a young man. He left home as a young boy and worked his way westward to the new frontier at lumber camps in Michigan and Wisconsin. Eventually arriving in southern Minnesota in the early 1860s. He served with Sibley during the Sioux Uprising of 1864. Seeking opportunity, Hodgeden eventually settled in Aitkin hoping to make a new home for himself in this burgeoning community. He carried mail, often on foot through woodland trails, to settlers that dotted the region. On a trip back to Aitkin via steamboat, Hodgeden met James MacDonald, a timber cruiser working in the region. They struck up a friendship that would last a lifetime and bring them prosperity. As these two men became acquainted by chance on this fateful riverboat trip, MacDonald talked about how cheap timber land in the Pacific Northwest was. At the time, MacDonald knew from his experience as a timber cruiser that Minnesota’s finite pinery supply was dwindling and that the next area of opportunity was beyond the Rocky Mountains. As Hodgeden listened, he quickly calculated an opportunity for the two men. Soon, both men traveled to the west, bought up cheap timber lands and waited their opportunity. It came by the turn of the century and it made both men a sizable profit. Their partnership extended into further investments. The men established a livery business, owned a local sawmill, an implement business, and continued in their lumbering interests. By then, the virgin pine was gone in this region, so hardwoods such as oak was what they concentrated on in their timber business. By 1902, Hodgeden envisioned a building to hold many of his business ventures and provide a base office for his growing empire. His daughter Irene, the pride and joy of her father, showed talent as an actress in school plays. Hodgeden wanted to incorporate an opera house into his new structure, just in case Irene’s gift for the stage matured. Catherine Hodgeden, Sam’s wife, cultivated literary and cultural interests and probably helped encourage the venture. Irene Hodgeden on the deck of the "Irene"
Irene Hodgeden was referred to as “the prettiest girl in town” in her high school annual. 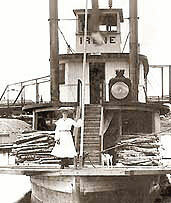 Steamboat operators Putney and Veibahn were impressed enough with Irene to name their steamboat after her. Although there is no known surviving record of such a transaction, some locals speculated that her father Sam Hodgeden may have invested in the boat, or made a loan for it’s construction. Irene never aspired to a career on the opera house stage as her parents may have dreamed she would. She did however eventually take over her father’s business and became one of Aitkin’s earliest prominent businesswomen at a time in history when men dominated commerce.